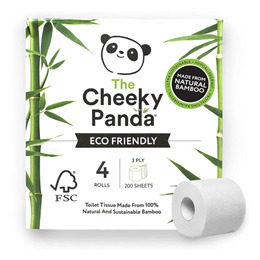 With 200 sheets per roll, The Cheeky Panda`s silky soft, pure and natural toilet tissue is made from 100% sustainable bamboo. Be kind to your skin. Southeast Asia is home to vast mountains where bamboo grows wildly; before The Cheeky Panda came along, much of the harvested bamboo was wasted. Today however, they`re busy whipping up this wonderful bamboo into luxurious tissue. The Cheeky Panda love the environment, and if you haven`t guessed, they think pandas are pretty awesome too. They source their bamboo far away from panda habitats, and by using bamboo rather than trees, they also help to protect rainforests which are home to plenty of other wild animals too. Who says that sustainable, natural and responsibly sourced products can`t be luxurious? With some seriously dedicated toilet paper specialists and super stringent testing processes, The Cheeky Panda ensure that every single sheet of tissue paper they produce is beautifully soft, yet robustly strong. Bamboo is anti-bacterial, anti-fungal, odour resistant and hypo-allergenic - all of which means that skin, even the most sensitive kind, simply loves bamboo; and no nasty chemicals such as harsh de-inking agents or B.P.A are added. This toilet paper is so pure, it`s positively angelic. 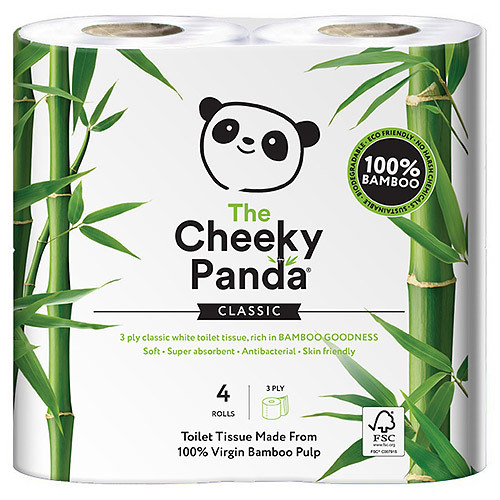 Below are reviews of The Cheeky Panda Toilet Tissue - 4 Rolls by bodykind customers. If you have tried this product we'd love to hear what you think so please leave a review. Never thought I could get so excited by toilet paper! It's really strong, even the cardboard roll in the centre is vastly superior to the average, handy for kids' creative projects! And the plastic wrap is biodegradable. All very satisfactory.